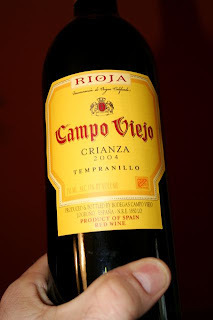 2004 Campo Viejo Crianza tempranillo from Rioja. Light in color with an interesting nose of rusty nails and red plums. The prune fruits come through a little bit on the palate along with a nice acidity and light red fruits. Nothing serious here but a decent quaff for the price. 82 points.